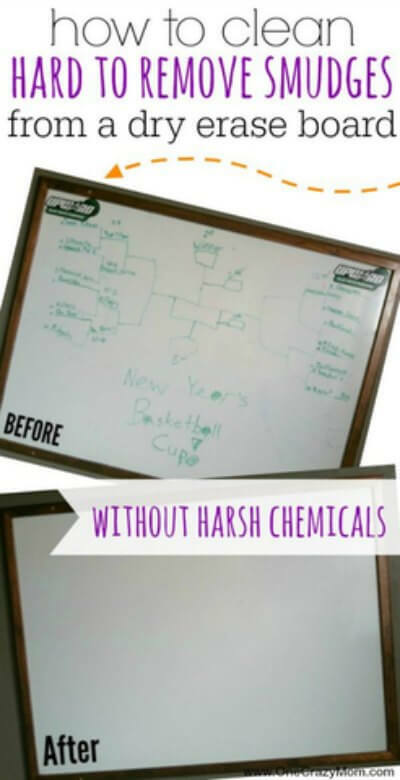 How to clean a dry erase board - 2 Methods without harsh chemicals! Time for another post in our easy house cleaning tips and tricks series. We have a huge dry erase board in our home and we love it – really, our kids love it! They love it so much that we have been left with what seems like smudges and marks that never come off. No paper towel or dry erase eraser would make the smudges come out. Honestly, they seemed to make them worse. 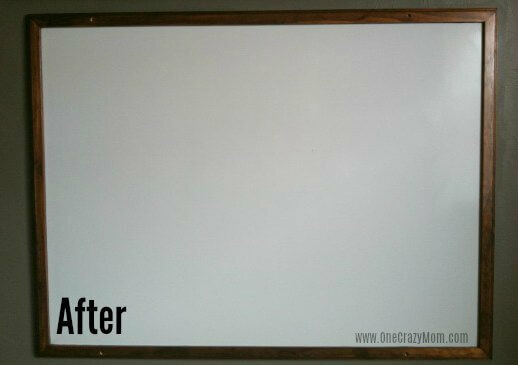 After trying several different ideas, I want to show you how to clean dry erase board with very little effort (and you’ll love the end result). I have tried two different methods but you probably already have the items needed laying around the house. No need to buy tons of cleaning products or special board cleaners. Are you ready? 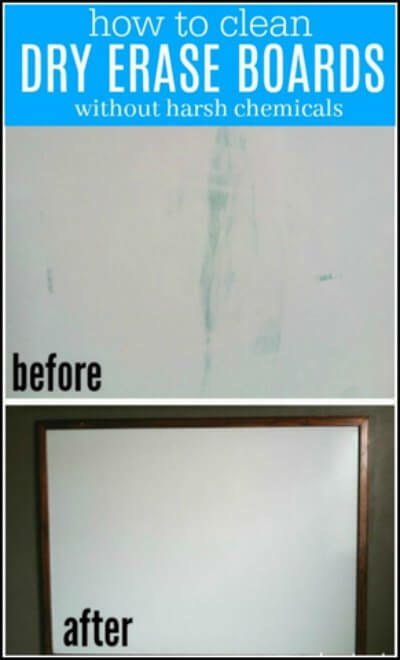 Let’s learn how to clean whiteboard without harsh chemicals and get some sparkling clean boards! You are going to love how easy this is and how frugal this solution is. It is a winner all around! How do you restore a whiteboard? Many years ago when I was a teacher, a fellow teacher shared with me that a used fabric softener sheet does wonders at getting the marks off of a dry erase board. The next time you do laundry, simply save the used fabric softener sheet. When you need the marker from your dry erase board erased, use the fabric softener sheet (instead of an eraser) and your done. If you have some smudges and marks that have been on your board for a while, using this method will require some elbow grease. I really prefer to use the fabric softener sheet on a daily basis for regular erasing. 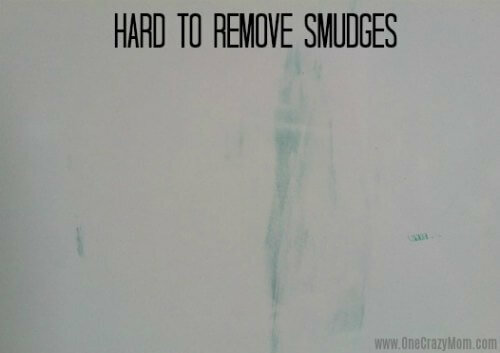 If you have some long term smudges, you are hoping to get rid of, you really need to try this next method. All you need here is a little rubbing alcohol (the 70% alcohol you have in your medicine cabinet will work perfectly) and a soft microfiber cloth. I like to buy the lint free cloths from Dollar Tree or you can buy similar ones from Amazon here. Simply dampen the end of your soft cloth with rubbing alcohol and wipe the smudges away. I was so amazed with how well this worked! We had some stray marks on the wooden frame around our white board and the rubbing alcohol got those off great, too. If I had known how to restore a dry erase board would be so easy, I would have done it ages ago! Plus, it’s so easy on the budget. And it uses items you likely already have at home. 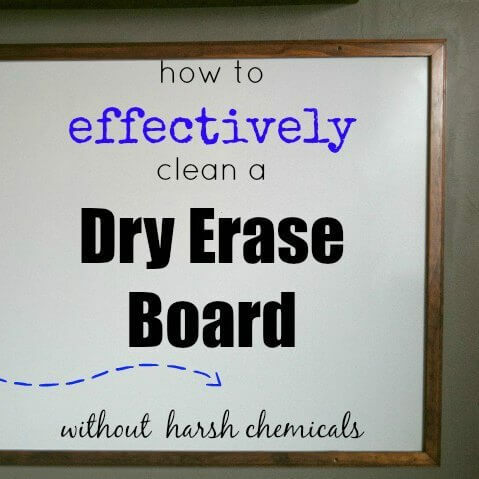 If you have wondered, how do you clean a dry erase board….give this a try! I am so please with how bright and new our white board looks! 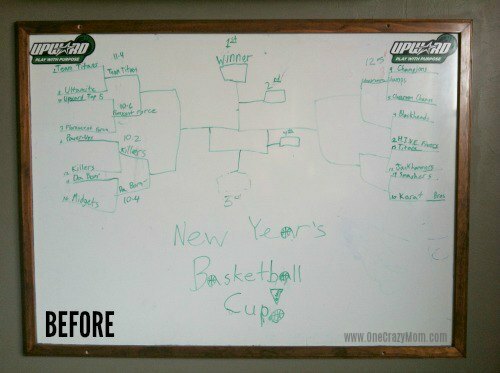 Confession: my kids were a little upset with me about erasing the bracket they had created. 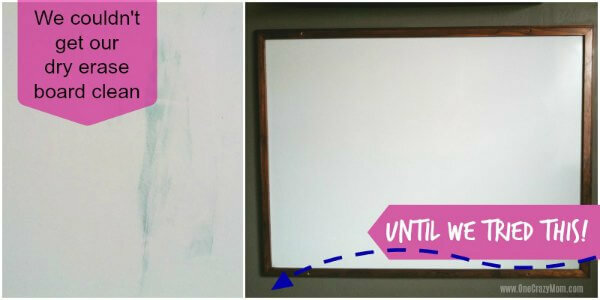 The next time you are wondering how to clean a dry erase board, be sure to try these methods. You will not be disappointed. They will love knowing how to clean a whiteboard that won’t erase! Bonus tip – You can clean the markers off the wall too! Now my beautiful, not so clean, children got some markers on the wall near our dry erase board. However, just a quick rub of the alcohol with the microfiber cloth and those marks were gone too! Do Clorox wipes ruin dry erase boards? These wipes certainly can remove stains, smudges and lingering dry erase markers. However, they can also remove the residue on many dry erase boards. I would recommend this option as this will cause the board to stop working over time as the finish comes off. How to clean a whiteboard with permanent marker? 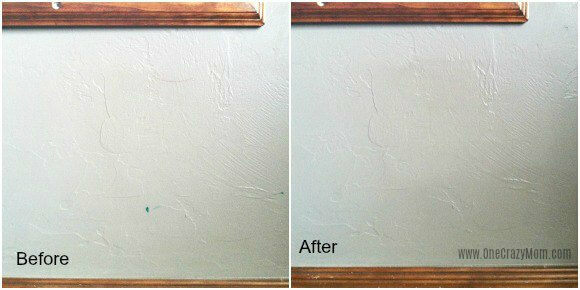 Give this cleaner a try to also remove permanent marker. Just note the longer it has been on the board, the harder it is to remove. Can you use Windex on a dry erase board? Yes you can. Just do not use anything abrasive that might scratch the board to wipe the cleaner. How do you clean a whiteboard with vinegar? You will need to mix the vinegar with water to clean a dry erase board. Only a teaspoon or so of Vinegar is needed per cup of water to use this method. How to clean a whiteboard eraser? A little soap and water will clean a whiteboard eraser. I have also heard of some people using toothpaste or baking soda when more abrasive cleaners are needed for stains that are lingering on the eraser. It is amazing how this works. Marker stains will be a thing of the past once you clean your dry erase surfaces with these new ideas. Now that you know how to clean a whiteboard without chemicals, why not head around the house and see what else you can clean quickly and easily. We loving making a cleaning solution at home such as this whiteboard cleaner. Once you clean the board, you will see how well it removes dry erase marker. Your white board will be good as new and you can tackle some other projects. Yeah! We save a ton of money by using products we can make at home. I feel like they work even better too. It’s great knowing we are using products that are budget friendly and work just as good if not better than store bought cleaning products. Please share any cleaning tips and tricks that you have. We are always looking for new ideas that we can try.